MartinLogan deserves a lot more respect. Of course, any audiophile knows that MartinLogan already gets a ton of respect, but the company gets props mainly for its big electrostatic speakers, which don't require the volume of engineering grunt work that conventional speakers with multiple drivers and complex crossovers demand. Based on my listening and what my Clio 10 audio analyzer tells me, MartinLogan does a pretty amazing job with plain ol' multi-way dynamic speakers, too--like the new $2,999/pair Motion 60XT tower I'm reviewing here. Want proof? I got it. 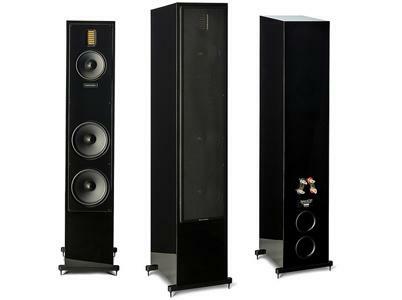 The company's engineers got the Feature on-wall speaker--a bizarre combination of cone woofers, an open-back electrostatic midrange, and a dome tweeter--to sound amazing and measure almost perfectly. The least expensive speaker the company makes, the $398/pair Motion 2, sounds great and measures as perfectly as any speaker I can recall encountering. The XT in Motion 60XT stands for "extreme," or perhaps more accurately "XTREEM!" as seen on packages of gum and tortilla chips. What's xtreem about the 60XT is mainly its tweeter, a larger version of the Heil-type folded ribbon tweeter popularized in the other Motion Series speakers and in models from GoldenEar Technology, Adam Audio, and others. The 60XT's Folded Motion tweeter measures 2.4 inches high by 1.25 inches wide, compared with 1.4 by one inches for the tweeters in the smaller Motion 40 and 20 tower speakers. According to MartinLogan, the larger tweeter doesn't necessarily sound different from a tonal standpoint, but it will allow the Motion 60XT to play louder with less distortion. It also permits the use of a lower crossover point of 2,200 Hz, compared with 2,600 Hz for the Motion 20 and Motion 40. This allows the use of a large, 6.5-inch midrange driver, which also helps the speaker play louder. The 60XT's woofer complement is also more xtreem: dual eight-inch woofers, compared with dual 6.5-inchers on the Motion 40 and dual 5.25-inchers on the Motion 20. A 6.5-inch midrange bridges the gap between the XT60's woofers and its Folded Motion tweeter. Sensitivity is rated at a very high 94 dB at one meter with a one-watt signal, compared with 92 dB for the Motion 40 and 90 dB for the Motion 20. So what we should have here is a speaker that sounds as good as the other Motion Series towers, but plays louder and delivers deeper, cleaner bass. Who wouldn't want that? Unpacking and assembling the pair of Motion 60XTs was easy, despite the speaker's 66-pound bulk. The only step between unboxing and connecting was attaching a pair of small metal outriggers that help keep the four-foot-tall speaker from tipping over. The speaker cable binding posts are beautiful, made with large plastic "wings" that make it easy to clamp down the posts very tightly on the cables using nothing more than your bare hands. A rather heavy metal grille attaches magnetically; I didn't bother using it, but I later ran measurements with and without the grille to gauge its effects. I started out by placing the Motion 60XTs in the same position I use for my usual Revel F206 speakers: front baffles 38 inches from the wall behind the speakers, with the speakers placed eight feet apart and nine feet from my head when I sit in my usual listening chair. (This is just what works for these Revels in my room for my taste, not a general prescription for speaker placement.) With the Motion 60XT, this sounded good but left me wanting a little more upper bass, so I pushed the speakers six inches closer to the wall behind them. Later, during my listening tests, I experimented with other speaker-to-back-wall distances in an attempt to better tune the Motion 60XT's bass to my room. I didn't experiment with toe-in, the degree to which the speakers are angled to or away from the listener. I started out with the 60XTs pointed straight at my chair and the treble sounded just right there, so I left them in place. My test rig was the usual: a Krell S-300i integrated amp, a ProJect RM-1.3 turntable with an NAD PP-3 phono preamp, and a Sony PHA-2 DAC/headphone amp connected to the Toshiba laptop that holds my music collection. "This is HAPPENING," I noted when I first sat down to listen to the Motion 60XTs after breaking them in for about 10 hours with pink noise. What I was listening to was bassist Ron Carter's LP Piccolo, a 1977 recording done live at the now sadly defunct Sweet Basil jazz club in Manhattan. So many things just struck me as right about the sound. First was the way I could tell, when listening to one of the tunes on Piccolo, that drummer Ben Riley was playing a fairly large ride cymbal and striking it close to the bell. I'm not used to hearing this level of clarity and neutrality in a speaker; even many high-end models don't convey the subtleties of cymbals. Another tough-to-reproduce instrument--piano--sounded so natural and so real that I couldn't spot any coloration, other than the unnatural width of the piano's sonic image due to the way the microphones were placed. Even the rendition of Carter's small, somewhat weird-sounding piccolo bass, which was the lead instrument in this quartet, was satisfying, with all the nuances of Carter's awesome technique easily audible without any unnatural edge or emphasis. The spatial presentation was intimate, as if I were sitting 10 or 12 feet from the band (which I did a few times at Sweet Basil). "What could be better about this?" I thought to myself...and what I came up with was that a larger, more expensive, very well-engineered speaker might give me a bigger sense of scale. Not that the soundstaging in a live recording in a Manhattan club should be huge, but I didn't get that much sense of the sound reverberating off the walls and ceiling. Wanting to keep the mood in a jazzy vein but eager to hear how the Motion 60XT handles vocals, I put on "New Frontier" from Donald Fagen's LP The Firefly. Once again, I got beautifully defined imaging between the speakers, and every bass note sounded perfectly defined and even, which I can tell is exactly what Fagen was always going for, both on his solo records and in Steely Dan. Fagen's voice didn't take on the harsh, edgy quality it does with many speakers, although I felt it could have used a touch more body. The lush background vocals didn't sound as huge and room-filling as they often do, but they did break out past the speakers toward the side walls. If there was any roughness in the transition from the tweeter to the midrange--so often the Achilles' heel of conventional cone'n'dome speakers--I couldn't hear it. Overall, I'd call the presentation "tight," as in precise, punchy, and accurate. When I switched to Art Blakey's Indestructible, I actually yelled a profanity I can't document here as the drums came in on "Calling Miss Khadija." That reaction's not out of line when you're listening to a jazz group whose front line at the time comprised Lee Morgan on trumpet, Curtis Fuller on trombone, and Wayne Shorter on tenor sax. But still, I just couldn't believe the amount of detail I heard in Blakey's drums. Indestructible is not really even a good recording, but the Motion 60XT pulled every little sonic detail out of it. I especially enjoyed being able to appreciate the subtleties of the then-young Shorter's developing tone. The stereo images of Morgan and Fuller popping riffs behind Shorter's solo were spectacular, but spectacular in a totally natural way. And then, again, the detail in Blakey's cymbals completely blew me away. "These are just really easy speakers to listen to," I noted when listening to a 256-kbps MP3 download of "Have You Met Miss Jones?" from the Oscar Peterson Trio's We Get Requests. Nothing seemed artificial. Nothing seemed colored. Nothing was distracting. Most of all, the tweeter didn't sound like a certain type of tweeter; it didn't have the typical mellowness of a soft dome, nor the occasional hyped-up detail of a metal dome. It just sounded natural.